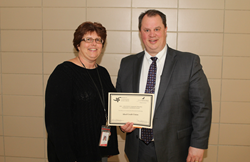 Ideal Credit Union was recently selected to receive an Excellence in Community Education Leadership (EXCEL) Award by the ISD 622 Community Education Advisory Council. Each year, the council recognizes individuals and groups who have demonstrated a commitment to lifelong learning with EXCEL awards. Cheryl Gysbers, Adult Programs and Community Gardens Coordinator, presents the EXCEL award to Ideal CU President/CEO Brian Sherrick. Grysbers nominated Ideal for the award. Gysbers cited Ideal’s unblemished history of delivering meals without fail every Thursday for the past 13 years, and monetary support through "Casual for a Cause," where employees pay for the privilege of dressing down for a specific day. Ideal Credit Union was nominated for the Community Contribution Award by Cheryl Gysbers, the Adult Programs and Community Gardens Coordinator, who oversees the Gladstone Meals on Wheels program. Gysbers cited Ideal’s unblemished history of delivering meals without fail every Thursday for the past 13 years, and monetary support through "Casual for a Cause," where employees pay for the privilege of dressing down for a specific day, matched by the Ideal CU Community Foundation. As an active community partner, Ideal Credit Union supports a variety of important causes that help fill a void and bring essential services to those in need. These include the annual Salvation Army Coats for Kids drive, MN Brain Tumor 5K, Second Harvest Heartland volunteer nights, donations to local food shelves, early childhood education, veteran’s outreach, and more. Ideal CU and the Ideal Community Foundation have a strong commitment to financial literacy and helping youth prepare for their financial future. These efforts have included Ideal CU volunteers working with elementary and high school teachers to highlight the basics of money management. Among the topics discussed are making and balancing a budget, building a credit history, how to apply for credit, responsible money management and more. Ideal opened a student credit union at Tartan High School in January of 2013. Ideal is dedicated to providing youth with the financial knowledge and resources they’ll need as they approach graduation and beyond. The “Money Talks” educational series, developed in partnership with Tartan student and school leaders, is held several times throughout the school year. The peer-to-peer program, led by Ideal CU Student Credit Union employees, is designed to teach students the building blocks of personal finance. The sessions focus on the key pillars of financial education: budgeting, savings and investments, credit, and money management tools. “The overall objective is to provide valuable financial education to students via their peers so they have the knowledge to make informed and conscious money decisions through all stages of life from youth through retirement,” said Ideal CU President/CEO Brian Sherrick. The seminar series also increases awareness of the student-credit union and credit unions in general, and provides the tools, assistance and education needed to help students build a strong financial future.